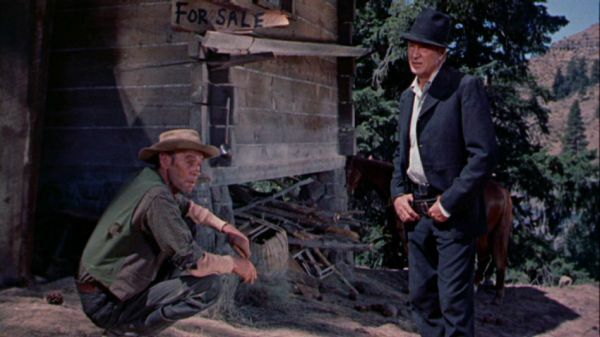 I don't know that Gary Cooper has played a character as foreboding or mysterious as Dr. Joseph Frail, who arrives in a new mining settlement (calling it a "town" would be premature in 1873 Montana) at the beginning of The Hanging Tree. All along, we suspect that he's a force for good - this is Cooper, after all - despite demonstrating a capacity for violence and the suspicion with which he is viewed by some of the prospectors and, in particular, the batshit faith healer Grubb (George C. Scott in his first screen role). This suspicion is exacerbated when a stagecoach en route to the settlement is robbed and overturned; the sole survivor, a Swiss immigrant named Elizabeth (Maria Schell), comes under the care of Frail, whose past intrudes when romance starts to bloom between them. As is often the case, Cooper is in complete command of the screen. His underlying strength here is tempered by the aforementioned threat of violence. We know he has set fire to a house. We suspect he may have killed someone. We even suspect that he is wanted - perhaps in another state or territory. All of this hearsay and rumor - uttered by some of the movie's ancillary characters, including the skeevy prospector Frenchy (Karl Malden) - is given some weight by Frail's quick temper and violent responses to the suspicious and nosy. Writer-director Delmer Daves has created a moral Western that poses the query: who has the right to judge others, and on what basis? Mysterious questions are answered about Cooper's character, and suffice it to say that the answers don't quite measure up to the fears of the miners. Frail is nearly hung toward the film's climax - his life having come very close to ruination at the hands of an anxious, unthinking mob. Daves' script and casting choices appear rather telling, particularly in the light of Gary Cooper's well-documented cooperation with Joseph McCarthy's House Un-American Activities Committee in 1947. However, Cooper did not name names, nor did he testify that he felt Communism was a particular threat in Hollywood. Ten years later, at the height of the Hollywood blacklist, he starred in The Hanging Tree, which deals with the blacklist in a fairly direct way: unfounded paranoia (mingled with greed; characters in the movie protect their claims the way friendly witnesses protected their careers) developing into a collective murderous rage with near-tragic consequences. Unsurprisingly for the era, Daves hedges here; his film ends happily, whereas the careers of some of his colleagues did not. Whether viewed as a metaphorical cautionary tale or as a straightforward suspense picture, The Hanging Tree works well. All of the performances (especially Cooper's and Malden's) are strong, and the Technicolor location photography by Ted McCord is outstanding. It's a carefully-crafted small-scale Western allegory that still comes across as subtle and sophisticated, even by today's standards. As I mentioned above, the photography is excellent, but the image quality would have benefitted greatly even from a cursory remastering. Some scenes are a bit pale, and dissolves in particular have suffered the weathering of the years. Still, the strength of the Technicolor process is in evidence here, even after more than fifty years. The mono soundtrack is in fine condition. It serves the film well without being ambitious in any way. The well-known title ballad, sung by Marty Robbins, was recorded in stereo, so its appearance here will be somewhat unimpressive for those familiar with the studio recording. The Hanging Tree is an enthralling Western morality tale, anchored by a charismatic and atypically dark performance by Gary Cooper. Delmer Daves fashioned an unusual script and shot much of it in beautiful mountain locations. A strong film that the Warner Archive Collection has thankfully made available for rediscovery. Recommended.